Last week at work I overheard one of my colleagues say (and I quote) ‘it’s too wet to go to the gym’. I can’t quite get my head around this one, given that most gyms I’ve visited have four walls and a roof designed specifically to keep the rain out, but apparently it’s the journey to the gym while it’s raining that’s overwhelming. So anyway, I thought I’d make life easier for everyone with another simple workout that you can do at home, no mad dash from the parking lot to the gym required. This one is for you Jenny. No equipment and minimal space required – just the way I like it. As always – any questions please let me know. Try it next time it’s horrid outside and let me know what you think! 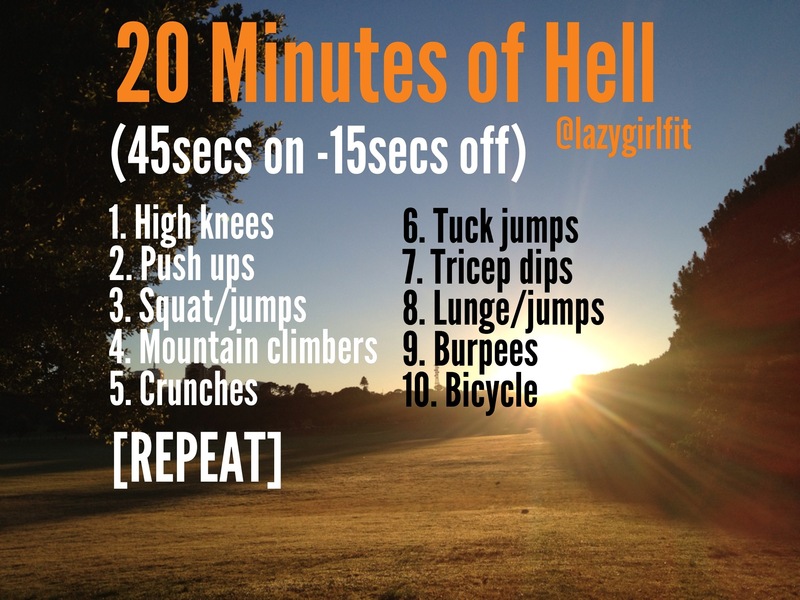 I love the simplicity of this heinous workout! I gather that you are a minimalist as well. Always! No need to over-complicate or re-invent the wheel!